At Professional Carpet & Upholstery Cleaners, we're getting ready for the season of giving! 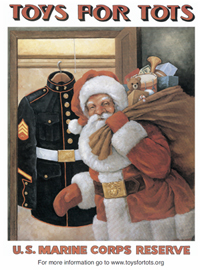 Join us again this holiday season in our effort to collect toys for the Marine Toys for Tots Foundation! We will be collecting toys and offering a special discount to our customers who participate by donating a toy! 1) Call us to schedule your holiday carpet cleaning, any time from Friday November 22 through Wednesday December 18, 2013.